paperbicycle: When it rains, it pours. Well, I cranked this one out a little late tonight. Things have been ridiculous at work(s). We've got a million deadlines and a million more projects going on. They're all really exciting, but man, when it rains, it pours. I was up late tonight working on my piece for an upcoming exhibition and trying to help Chris get a bunch of holiday cards done for one of my clients. 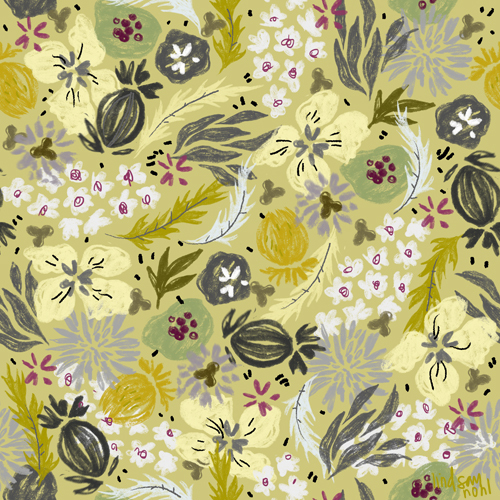 The color palette for my pattern tonight comes from all of the weird drinks I've been trying over the last day or two. I went to Whole Foods and bought some probiotic vegetable drinks, some chia seed drinks, and some other weird flower essences. Most of those drinks are green, but there was one beet and ginger flavored drink that I snuck in there that was a bright magenta. I also was trying something a little looser tonight. I've got this brush pen that I've been playing with that runs out of ink pretty quickly, but I like the texture it's got and I keep using it. Ah, those happy mistakes. this pattern is lovely! and I adore where you got the inspiration from! Nice work! Fun News! Making things in 2013!